HighWinds Lodge and Cottages follows, in a much humbler way, the storied tradition of the Lake Dunmore House of the mid-nineteenth century, one of Vermont’s most renowned destination resorts of the era. The original site is only a stone’s-throw away. The grand hotels are gone, but the magic remains. Sleepy Oaks Resort was constructed in the 1920s and provides the footprint for HighWinds. 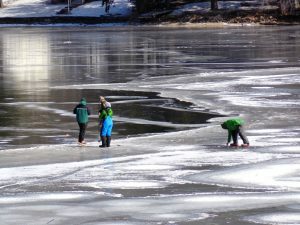 * About a mile across the lake from HighWinds, Branbury State Park was opened in 1959, offering public access to picnic grounds and an ample sandy beach. Campsites, vacation homes, and cottages discretely surround the three-mile-long lake, and it remains somewhat more serene then many of the region’s lakes. * James and Max Petersen. Lord Dunmore’s Lake. (Dunmore House Publishing, Salisbury, VT, 1998), 39, 86. Pine Lane, just off Vermont Route 53, is the quiet, tree-lined access to the Sleepy Oaks Association of which HighWinds is the principle part. 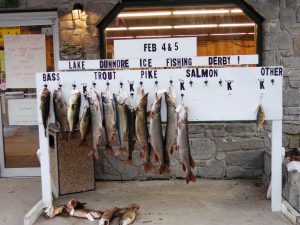 A nearby general store in easy walking distance provides household necessities and beverages plus bait, fishing tackle and licenses. An ice cream shop/delicatessen at the head of the Lane, provides light refreshment and casual ambiance throughout the summer season. HighWinds Lodge and Cottages offer a 1920s theme enhanced by rigorous maintenance, regular upgrades, and tasteful furnishings, all with our guests in mind. Det er et hygellig sted og jobbe! Lake Dunmore is in the township of Salisbury, located in central Vermont, on U.S. Route 7, the major north-south highway along the western slope of the Green Mountain chain. State Routes 53 and 73 provide paved access to the lake off Route 7. High Winds is located on the shore of Dunmore’s North Cove, looking eastward up the slopes of majestic Mt. Moosalamoo. Nestled at the foot of the mountain is Camp Keewaydin, one of the oldest, most respected boys camps in the nation. It sister camp, Songadeewin, is located on the opposite shore of the North Cove. While the camps are shrouded from view by the green forest, it is not uncommon to hear the occasional shouts of joy from boys and girls at play. HighWinds has the privilege of offering one hundred feet of private sandy beach with dock space for boats, a floating platform for swimming and diving, and the quiet of a “wake-free” boating zone. The lake bottom from the beach deepens very gradually and makes getting in the water fun and easy. Guests are no more than thirty seconds from the beach and just minutes from a soft-serve ice cream or morning paper. Major shopping is only a fifteen minute drive to the town of Middlebury, home to highly regarded Middlebury College, which offers many cultural opportunities to the public all year round. The town also offers many highly touted restaurants and eateries, breweries, wineries, orchards, museums, libraries, and theaters. Explore the many antique shops and historical landmarks of the Champlain Valley on day trips. Burlington International Airport is within an hour of Lake Dunmore. During my lifetime I have had the great fortune to travel many places, but what I appreciate the most is living amongst the lake’s year round residents, learning where they eat and where they like to hike and swim. To experience local flavor is to fully experience the place you are visiting. Pine Lane is local flavor.